Wab Kinew’s historic win of the Manitoba NDP leadership has been clouded by allegations of domestic assault 14 years ago and an attack-filled website created by the Progressive Conservatives. Manitoba NDP Leader Wab Kinew's historic win has been clouded by allegations of domestic assault and an attack-filled website created by the Progressive Conservatives. "The person who ran to become leader of the NDP, that was chosen on the weekend, the person that will be running to be premier in 2020, is the person that I am today," Kinew said on CBC's Information Radio on Monday. "That is a person who is not running away from my past but rather is running because of the journey that I've been on." 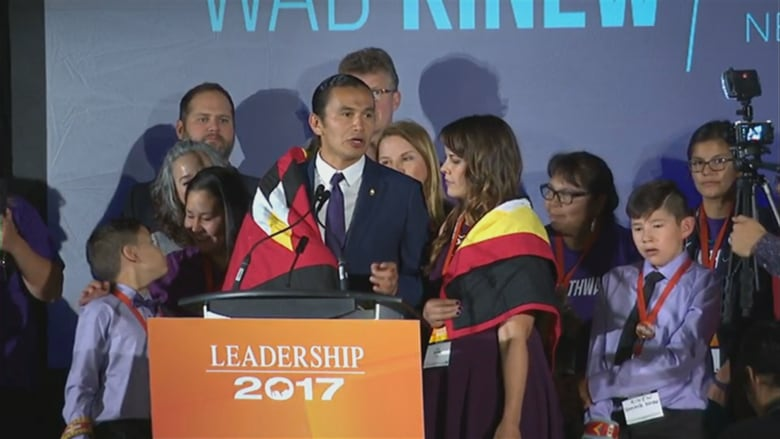 Manitoba's New Democratic Party elected Kinew as the new leader on Saturday, with Kinew taking 728 votes and his opponent, former MLA Steve Ashton, taking 253. Kinew became the first elected First Nations leader of a major party in Manitoba, but within 30 minutes of the historic moment, the Progressive Conservatives launched an attack website against him. WabOn.ca has screen grabs of past misogynistic and homophobic tweets, sent as far back as 2009, a summary of past charges of domestic assault and links to news stories and opinion columns that are critical of the rookie politician. On Sunday, the website also held a Winnipeg Free Press article in which the family of the woman at the centre of those 14-year-old domestic assault allegations spoke out with new details. Tara Hart's mother and sister alleged that when Kinew and Hart were living together in 2003, an argument between the young couple turned violent. They allege Hart tried to leave the couple's downtown apartment and Kinew threw her across a room, causing rug burns on her arms and legs. They also allege that Kinew grabbed Hart by her hair and dragged her down a hallway. Hart told the Canadian Press on Thursday that the rug burn incident prompted her to end their two-year relationship, move out and contact RCMP to file a complaint. Court records show Kinew was charged in June 2003 with two counts of assault on Hart. In June 2004, the Crown stayed the charges. The court records provide no explanation for why the charges were stayed. The family called for Kinew to apologize. Kinew has denied the allegations and when asked on Monday if he still denied the specifics about what the family alleges happened he responded: "Yes." "I feel a lot of compassion for this family. I knew them well at one time in my life and it's clear that I hurt them, and I accept responsibility for the fact that I was not a good person for a time in my early 20s and this has left issues that are unresolved with them," Kinew said. Kinew said he has always answered questions about his past with honesty, but added digging up his past is causing Hart's family pain. "The only reason this is coming out now is because I decided to put my name on a ballot and, because that was my decision, I accept responsibility for the hurt that this is causing them and I apologize," he said. It was a step further for Kinew in seeking redemption for past actions, said Paul Thomas, professor emeritus of political studies at the University of Manitoba. But it might not be enough for the party to come out unscathed, he said. "[Kinew's] endorsement was across the board — from within caucus, from organized labour, from women, from all parts of the province. When you obtain 75 per cent of delegates, it means that all the various component of the coalition were behind this leader and now, sadly for the NDP, there's a cloud over his leadership," Thomas said. With the PC-run website already up and running, Thomas said it will likely be an uphill battle for the NDP to unite people around Kinew. There will be some who believe that people can change, Thomas said, but there are others who think that with Kinew in charge, the "NDP destroyed any prospects they had of winning the next election." "[They will think] this leader is a flawed person, that he's done bad things in his life. No matter all the nice words he is able to present, he is not credible," Thomas said about the latter group. "Credibility is a key attribute for leaders in this day and age." That doesn't leave the young New Democrat leader without a chance, Thomas said — it will just be more difficult. "I am not sure what the future holds. It's going to be difficult, undoubtedly, for Mr. Kinew to establish a reputation as a person of integrity and honesty and credibility and so on," Thomas said. "It's going to be much, much harder." Kinew said he recognizes people will have questions, and the only way to respond is "by putting the time in with people to listen to their concerns, answer their questions and to speak with them openly and honestly." "There will be many questions. People will be skeptical about me," he said. But he said he hopes that as leader, people will see him working to hold the PCs accountable on health-care changes, job creation and economic growth, and being an ally to women in the party and the province. We initially reported that the charges were stayed in 2003. In fact, the charges were stayed in 2004. Can Wab Kinew rise to the challenge of leadership?